Join this grandiose celebration of music and art! March Music Festival: Every March, hundreds of musicians from all over the world gather in Budapest to celebrate Spring with a series of Opera, Concert, Ballet and theatrical performances. This festival is one of Europes major cultural events and is frequented every year by Hungarian and foreign celebrities. 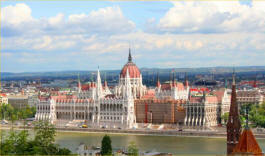 There is a sort of magnetic quality that the Hungarian capital radiates. Peaceful and bustling, a big metropolis and yet friendly, it treasures the old and embraces the new. Here the historic blends with the modern, the hills harmonize with the river, it is a city where there is always something happening.